In order to expedite financial inclusion, finance minister Arun Jaitley in his budget speech said “RBI will create a framework for licensingsmall banks and other differentiated banks. A robust risk management framework is required and the banks would be subject to all prudential norms and RBI regulations that apply to existing commercial banks, including maintenance of CRRand SLR. In December, more than 190 countries will meet in Paris for an annual conference which, this time, is expected to deliver a global agreement to fight climate change. India, the fourth largest emitter of greenhouse gases, is likely to play an important role. The annual meeting is called CoP, or Conference of Parties, ‘parties’ being a reference to the 196 signatories to the UN Framework Convention on Climate Change, or UNFCCC, that came into force in 1994. The Paris meeting is the 21st meeting of the CoP, and hence it is being called CoP-21. Climate change is believed to be a consequence of global warming, which in turn is a result, primarily, of emissions of greenhouse gases, mainly carbon dioxide and methane. The solution, therefore, lies in reducing the emissions of these gases. The difficulty is that almost every human or industrial activity involves use of energy which is produced primarily by burning fossil fuels such as coal or oil, all of which have high carbon content. The burning process releases carbon dioxide in the atmosphere as a byproduct. Carbon dioxide is produced in other industrial processes as well. The idea, therefore, is to move to processes that do not release carbon dioxide, or minimises their emission. In terms of energy, it means moving to non-carbon based sources like solar, wind or nuclear. Better technology can make industrial processes more efficient, and lower carbon emissions. The main objective of climate negotiations is to deliver an agreement that will facilitate the reduction of greenhouse gas emissions, the only way to mitigate climate change. Science says the increase in average global surface temperatures needs to be restricted to within 2 degrees Celsius compared to pre-industrial times, or the year 1850, in order to ward off “catastrophic impact” of climate change. The 2-degree target corresponds to a certain maximum amount of carbon dioxide that can be left accumulated in the atmosphere, often referred to as ‘carbon budget’. With most of this budget having already been utilised by the emissions in the last 150 years, scientists have shown that at the current rate of greenhouse gas emissions, the budget would be exhausted in the next 25 years. Emissions have to be reduced substantially in order to keep the planet below the 2 degree target. Since emissions are the result of production and consumption of energy, and of industrial and other processes, emissions reduction cannot happen without impacting economic activity. Countries such as India, for whom rapid economic growth is essential, are emitting more greenhouse gases because of growing industrialisation, housing, and urbanisation. Cutting emissions will mean slowing these activities and, thus, economic development. In richer and developed countries, cutting emissions will mean altering lifestyles, giving up big private vehicles to embrace public transport, and reducing consumption. Much of the problem of climate change is attributed to accumulated greenhouse gases emitted in the last 150 years by countries that first benefitted from the Industrial Revolution. More than 80 per cent of the greenhouse gases present in the atmosphere today have been emitted by these developed countries, mainly in North America and Europe. In the spirit of justice and equity, the UN Framework Convention of 1994 sought to place the burden of mitigating climate change primarily on these countries. The Convention evolved a principle of Common But Differentiated Responsibilities and Respective Capabilities (CBDR-RC) which demanded a bigger response from countries that were historically responsible for the problem, and which were also more capable of responding effectively. Most of the rich and technologically advanced countries of the west fitted both criteria. The Convention divided the world in two clear groups, one comprising countries — 37 of them initially — that were listed in Annexure I and were required to take mandatory emission cuts, and the other comprising the rest of the world, and called ‘non-Annex’, who could take other measures to deal with climate change, like adaptation, but were not required to mandatorily reduce their emissions. CBDR, or differentiation, is the principle that every developing country, including India and even China, swears by at the climate negotiations. It is at the heart of the Kyoto Protocol, the existing global arrangement for fighting climate change that came into being at CoP-3 in Kyoto, and gave quantified emission cut targets to every Annex-I country. CBDR has since been steadily diluted, and the clear-cut bifurcation of the world between Annex-I and non-Annex countries slowly eroded, thanks to persistent efforts of the rich and developed world. Kyoto Protocol itself has run into trouble, and is slated to expire in 2020, after which an agreement expected to be delivered in Paris will take over. The climate agreement currently under negotiation, which is likely to be finalised in Paris, is going to be structurally very different from the Kyoto Protocol. Kyoto Protocol took a top-down approach, in which the Annex-I countries were assigned specific emission cut targets, to be achieved in a specified time. The agreement under negotiation has taken a bottom-up approach, in which every country, and not just those in Annex-I, decide their contribution in the fight against climate change, through an instrument called INDCs, or Intended Nationally Determined Contributions. The CBDR has been all but demolished by this approach, although there is an understanding that the contributions of the rich world would have some mitigation targets, even if self-determined, while developing countries can choose to take other kind of actions, such as adaptation. Finance and technology are two of the several other elements that will make up the proposed climate agreement. Both these resources, which have an important role to play in finding climate solutions, are primarily with developed nations. The demand is that the rich world, being mainly responsible for global warming, should provide money and technology to poorer nations to build their capacities and help them adapt to climate change. Developed countries have agreed to mobilise $ 100 billion every year from 2020. A technology transfer mechanism too is being finalised. As a non-Annex country, India is not expected to engage in any mitigation activity. India’s primary interest in the negotiations is to see that this remains so. It has a strong domestic programme, based on a National Action Plan on Climate Change, that includes mitigation actions — but it does not want to turn these into international commitments. India wants the proposed climate agreement to be in accordance with the principles of CBDR and equity. It wants developed countries to take bigger emission cuts that are consistent with the 2-degree target. It also wants them to provide adequate finance and technology to developing nations to help them fight climate change. India says it is already doing much more on climate change than it is required to, and can do even more if it gets money and technology from the developed countries. India is set to announce its INDCs any day now, in which it is likely to set a target for reducing its emissions intensity — emissions per unit of GDP — for the year 2030, apart from listing the other measures that it is taking. With a bank account, every household gains access to banking and credit facilities. This will enable them to come out of the grip of moneylenders, manage to keep away from financial crises caused by emergent needs, and most importantly, benefit from a range of financial products/benefits. Various initiatives were taken up by RBI / GoI in order to ensure financial inclusion. During 2005-2006, RBI advised Banks to align their polices with the objective of financial Inclusion. Further, in order to ensure greater financial inclusion and increasing the outreach of the banking sector, it was decided to use the services of NGOs/SHGs, MFIs and other Civil Society Organizations as intermediaries in providing financial and banking services through use of “Business Facilitator and Business Correspondent Model”. 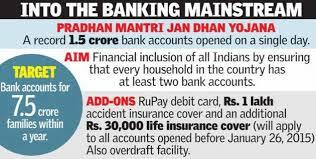 · Out of 24.67 crore households in the country, 14.48 crore (58.7%) households had access to banking services. · Of the 16.78 crore rural households, 9.14 crore (54.46%) were availing banking services. · Of the 7.89 crore urban households, 5.34 crore (67.68%) households were availing banking services. · In the year 2011, Banks covered 74,351 villages, with population more than 2,000 (as per 2001 census), with banking facilities under the “Swabhimaan” campaign through Business Correspondents . However the program had a very limited reach and impact. The mission mode objective of the PMJDY consists of 6 pillars. During the 1st year of implementation under Phase I (15th August, 2014-14th August,2015), three Pillars namely(1)Universal access to banking facilities (2) Financial Literacy Programme and (3) Providing Basic Banking Accounts with overdraft facility of Rs.5000 after six months and RuPay Debit card with inbuilt accident insurance cover of Rs 1 lakh and RuPay Kisan card, will be implemented. Phase II, beginning from 15th August 2015 upto15th August,2018 will address (1) Creation of Credit Guarantee Fund for coverage of defaults in overdraft A/Cs (2) Micro Insurance and (3) Unorganized sector Pension schemes like Swavlamban. In addition, in this phase coverage of households in hilly, tribal and difficult areas would be carried out. Moreover, this phase would focus on coverage of remaining adults in the households and students. The plan, therefore, proposes to channel all Government benefits (from Centre/State/Local body) to the beneficiaries to such accounts and pushing the Direct Benefits Transfer (DBT) scheme of the Union Government including restarting the DBT in LPG scheme. MGNREGS sponsored by Ministry of Rural Development (MoRD, GoI) is also likely to be included in Direct Benefit Transfer scheme. Households are being targeted instead of villages as targeted earlier. Moreover both rural and urban areas are being covered this time as against only rural areas targeted earlier. The present plan pursues digital financial inclusion with special emphasis on monitoring by a Mission headed by the Finance Minister. Such accounts can be opened with zero balance. The deposits will earn interest, an accidental insurance of Rs 1 lakh will be provided along with a life insurance cover of Rs 30,000.